I know nothing about this boat, or why it’s here. The best guess I have is that it was brought here to be broken up into scrap. There seemed to be a lot of other scrap metal in the area so that is most likely. Despite the no trespassing signs that litter the area, this old boat makes a good picture opportunity from the road. To get there, head over the Astoria-Megler Bridge between Oregon and Washington, then turn right. The boat is hidden behind a small cape, so watch the rear view mirror. Rained all the last night, this morning it became Calm and fair, I preposed Setting out, and ordered the Canoes Repared and loaded; before we could load our canoes the wind Sudenly Sprung up from the S. E and blew with Such violence, that we could not proceed in Safty with the loading. I proceeded to the point in an empty Canoe, and found that the waves dashed against the rocks with Such violence that I thought it unsave to Set out with the loaded Canoes— The Sun Shown untill 1 oClock P M which afford us time to Dry our bedding and examine the baggage which I found nearly all wet, Some of our pounded fish Spoiled in the wet; I examined the amunition and Caused all the arms to be put in order. Anyone who has been to Astoria and the Oregon Coast this during the winter months knows exactly what Lewis and Clark went through. To make matters worse, they accidentally picked one of the worse places to camp weather wise. Directly on the river and with little cover. 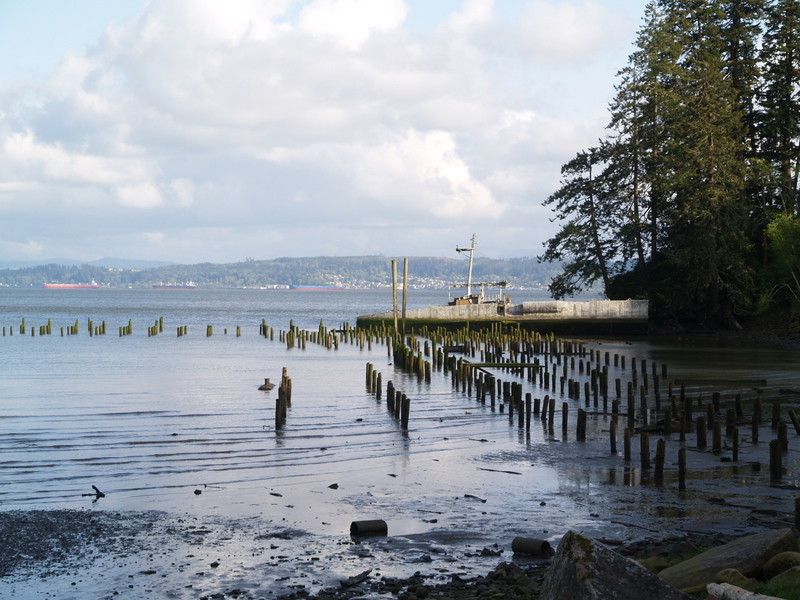 The area is now a National Historical Park, and served as a ferry landing for several decades, but it is very hard to imagine a party of 30 men, one woman, and one child sheltering here in any way for any length of time. Oh really? Do you by chance have any information about it? That’s really cool! It was an experimental Hydroplane that was developed by the Navy during the Viet Nam War. It never worked out so was decommissioned and sold for scrap. A friend purchased the dedication pamphlet when it was first commissioned and began its trial runs. The pamphlet listed its skipper and crew. I have going past it for about twenty years and have walked down to it some what. For a long time there was a crane also at the site. It looked like someone was going to scrape it on the cheap, but gave up it and walked away. I believe the crane as since been pulled away. It is an all aluminum boat making its scrapping difficult. So it is still there.